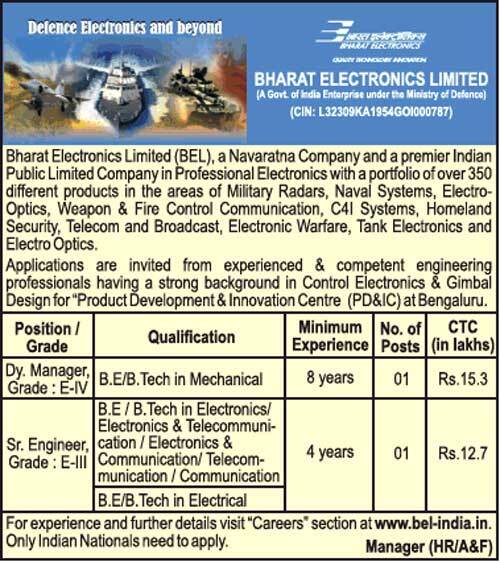 Bharat Electronics Limited (BEL), a Navaratna Company and a premier Indian Public Limited Company in Professional Electronics with a portfolio of over 350 different products in the areas of Military Radars, Naval Systems, Electro-Optics. Weapon & Fire Control Communication. C4I Systems, Homeland Security, Telecom and Broadcast, Electronic Warfare, Tank Electronics and Electro Optics. Applications are invited from experienced & competent engineering professionals having a strong background in Control Electronics & Gimbal Design for “Product Development & Innovation Centre (PD&IC) at Bengaluru.